(Feb.08, 2016, Los Angeles) – The UCLA Graduate School of Education and Information Studies celebrated the establishment of a new United Nations Educational, Scientific and Cultural Organization (UNESCO) Chair in Global Learning and Global Citizenship Education Monday night at the Skirball Cultural Center in Los Angeles. Speech of UNESCO Director-General Irina Bokova during the conference. 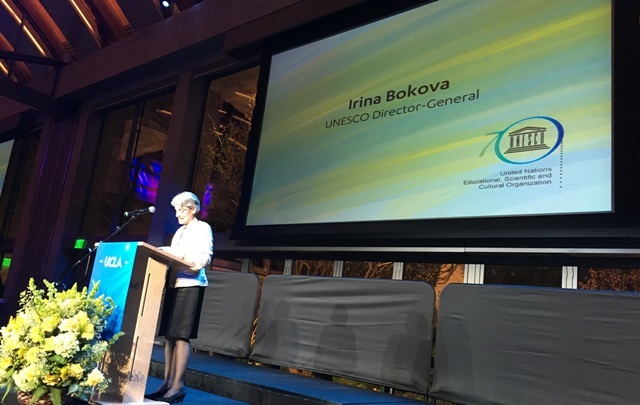 The new UNESCO Chair was officially announced at a celebration honoring the 70th Anniversary of UNESCO featuring Director-General Irina Bokova. She was welcomed by UCLA Chancellor Gene Block and introduced by Los Angeles Mayor Eric Garcetti. The UNESCO Chair in Global Learning and Global Citizenship Education will further the work of the University to understand and improve global learning and citizenship and its importance in protecting the environment. The effort includes the development of a new UCLA initiative in Children’s Environmental Education with the UCLA Lab School and the UCLA Institute for Environment and Sustainability. 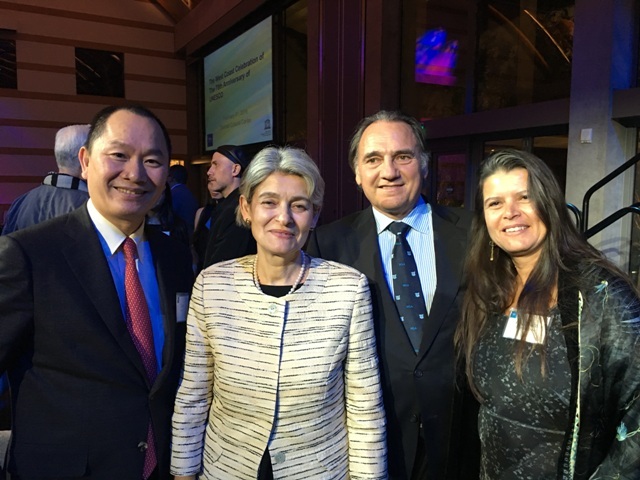 “We are very pleased to join with UNESCO in celebrating their 70th Anniversary and honored to partner with them in seeking to achieve their goals of global sustainability through the promotion of global education and citizenship,” said UCLA GSE&IS Wasserman Dean Marcelo Suárez-Orozco. “Improving global education and citizenship is critical to reducing poverty and inequality and key to protecting the environment. This new collaboration will greatly boost the efforts of UCLA to bring global citizenship education to a new level of excellence, rigor, and relevance,” Suárez-Orozco added. Mr. Nguyen Anh Tuan, CEO of the Boston Global Forum and Chair of International Advisory Committee of UNESCO-UCLA Chair on Global Learning and Global Citizenship Education; UNESCO Director-General Irina Bokova; UCLA Distinguished Professor and UNESCO Chair holder Professor Carlos Alberto Torres; and Dr. Ana Elvira Steinbach Torres. UCLA Distinguished Professor of Education Carlos Alberto Torres will serve as the inaugural UNESCO Chair. The work of the new chair will promote an integrated system of research, training, information and documentation on global learning and global citizenship education and foster excellence and innovation in research and practice. The Chair will facilitate collaboration between high level internationally recognized researchers and teaching staff of the University and other institutions across the globe. At the event, global philanthropist and education leader Courtney Sale Ross was also honored as the inaugural recipient of the UCLA Global Citizen Award, which recognizes individuals making transformational change for children through visionary leadership in education in the global era.